Nisyros is a quiet paradise. When many island resorts are being over run by tourists, traffic and commerce, Nisyros remains as an unspoiled haven of peace and tranquility. Nisyros possesses the clear water beauty of the Aegean sea coupled with a small village atmosphere. There are no busy intersections only small coastal and mountain roads. All year round it offers spectacular vistas. Nisyros is the place to come when you seek peace, tranquility and rejuvenation. Please feel free to submit your own writings or photos. Email these to paul@nisyros.net . Please email me with your news and stories about Nisyros. The email link is at the bottom of this page. Over the years it has been so good to publish this site with all of your stories. Keep the news coming in. Kumar, as we call him, and I became aquainted on our last trip to Nisyros. Recently he sent a movie that he produced and we post it for your enjoyment. The video is entitled "NISSYROS IN RAAG DES"
The John G. Phillips Foundation Scholarship Foundation is accepting applications. Please go to the site and read about this wonderful man who has left a very practical legacy. We met Barry and Enfys on the path from Evangelistra to Emborios. They were looking into a cave in the side of a cliff as we approached. Barry would soon plunge himself into the darkness and give us all a detailed description of the hidden treasures that lay within. Later we discovered that Barry had recently emailed me and that he wanted to tell folks about the island and share his photos. So we have here his story about Nisyros along with many photos. We thank them for sharing and hope that you enjoy! This June 2006 our family made a trip to Nisyros. We had many spectacular adventures that we would like to share with you at the following link. Please send us photos and stories about your adventures! Beate and Dr. Juergen Franke's walking map. For hikers we recommend this map. Thanks to the publishers for making their painstaking work and efforts to make this possible. Bill Sakellaridis contributed some more interesting photos from the early 1900's. Some of these have important historical significance. Bill Sakellaridis contributed an old and rare postcard that gives us some insight into what life was like in North America for those that left Nisyros. September 2004 We have finally finished renovations to my Grandfather's house! Click Here For PHOTOS This property is available as a vacation rental and sleeps 6. Special thanks to Loula, my wife and my father. Thanks also to Ed for the photos. A special thanks to Bill for sending old family photos and preserving these treasures for generations to come. "Children of Mandraki 1950" and "A few good men 1947"
This year the Gnomagoras Society Celebrates 100 Years of dedication to our Greek-American community in the United States and our beloved island of Nisyros. Note: These files may be quite large and take more time to download. 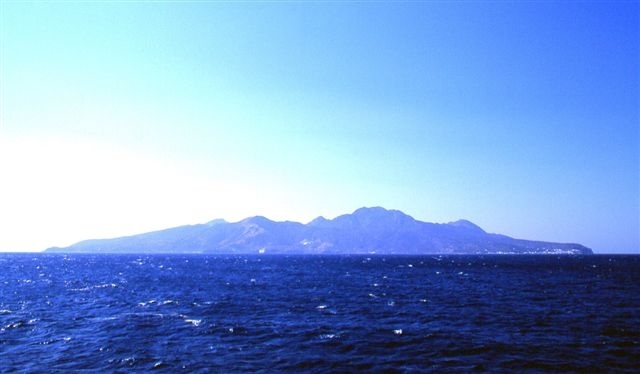 Cornelis publishes his story about Nisyros. Cornelis has published great works about the Island in two recent books and is an amazing photographer. Included in his story are photos, poems and prose. "Click here for Cornelis' Story"
This Old Home- We have finally completed work on the renovation of my great grand parents house. This work began over 28 years ago and with the help of many people we can say that it is completed. The article entitled "This Old Home" is a guide to others who would like to renovate property on Nisyros. Christos Christou Jr. published the Georgakis-Stamathis Family Genealogy. This work details the people in these families since the late 1800's. Thanks Christos for contributing such a tremendously important work. Download Rich Text Format Here. Christos can be reached at abcgenealogy@comcast.net should you have more information for him. Special thanks to my father and Nick Sfakianos for all their help with photos and stories. Nisyrian Family Photo Album goes online. Special thanks to Nick Sfakianos for all his help with translation and history. These people are looking for a son of Emanuele Patta. The Genealogy of the Contover Family. This has been contributed by Dean Contover. Ed and Georgia Prothero update their story. Thank you Ed and Georgia for sharing your adventures. Thank you Daniel. We look forward to seeing your content as you complete it! Artin Caracasian Learn about a resident Artist who enriches the Nisyrian experience and enables everyone to take a piece of Nisyros back to their home. Campanis Genealogy Research See My Family Tree. We are looking for more information on the Greek side. Ellis Island Documentation. This is a free site with ship manifests that document Nisyrian arrivals in New York City. Kostas Kampanis revised his Greek site on Nisyros. Kostas is a relative of mine and has done a great job building a site in Greek.